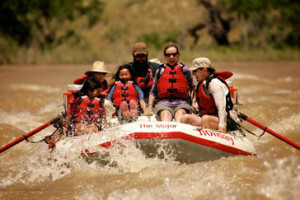 The Colorado River Rafting trip has, for years, been one of the most popular trips offered at Holiday River Expeditions. That fact has a lot to do with the river itself. The Colorado River is known as one of the best rivers in America. It offers everything a rafting or white water enthusiast could ask for. The Colorado River, including Cataract Canyon, offers something for every adventurer, from novice to highly experienced. There are multiple side canyons that you may adventure down to discover some of the most amazing wilderness areas found anywhere. You will also enjoy relaxing on any of the beaches found along the Colorado River. These are a great place to pull in and stretch your legs while we take a little break from the excitement of the white water rapids. 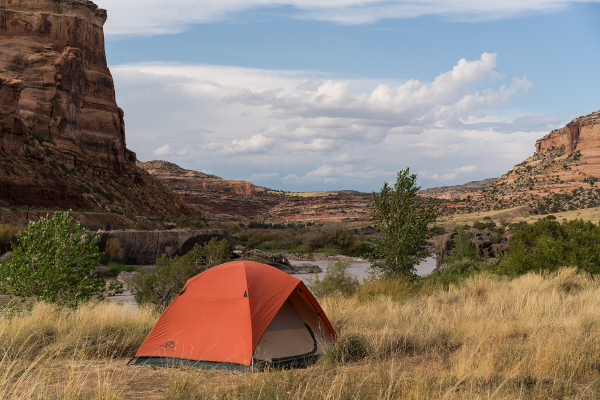 The Cataract Canyon trip down the Colorado River will include many comfortable campsites along the way. This is normally a five or six day trip. There’s nothing quite as exhilarating as camping for the night on the Colorado River. Adventure seekers relish the sounds of the water, the smells of wild herbs and grasses, not to mention campfire coffee brewing and steaks on the grill all prepared while you relax; these are the things that you’ll remember for a lifetime! Cataract Canyon itself is a geologist’s paradise with 300 million years of rock formations to explore. From breathtaking wildflowers to desert cactus, the sights in Cataract Canyon are magnificent. The canyon is also home to large herds of Desert Big Horn Sheep, eagles, deer, and blue heron, just to name a few. After 46 years on the river, Sue Holladay, co-owner of Holiday River Expeditions, knows what explorers love after a day of running rapids. The menus on the Colorado River trip include something for everyone, even if you have certain dietary restrictions. All food is bought from local markets so that your meals are always fresh and delicious. Some of Sue’s favorite recipes include steaks, salmon, Dutch-oven lasagna, salads and brownies for dessert. You won’t even have to do the dishes! Breakfast includes freshly made omelets, blueberry pancakes, sausage, fruit, yogurt, and cereal. We always have plenty of freshly brewed coffee, not to mention juice, water, tea, and hot chocolate. Lunch consists of a buffet serving deli sandwiches, chicken Caesar wraps, PB&J sandwiches, chips, fruit, and cookies. You can relax under a lovely shade tree while you get to know the other members of the expedition. We also offer a mid-morning snack of lemonade and trail mix to stave off the hunger till lunch time. At dinner, we’ll pitch our tents for the evening and set up the mess tent so we can prepare the best darn meal you’ve ever had. Your dinner meal will include freshly prepared appetizers that include veggies, a cheese plate, chips and salsa. Wash these down with a nice glass of wine or mug or beer. Alcoholic refreshments are BYOB but we will keep everything cold for you. Your gourmet meal will be grilled or prepared in a Dutch oven, whichever you prefer. The main meal includes fresh salads and breads and for dessert, brownies, pineapple upside down cake, or sopapillas. We always prepare plenty so be sure to come back for seconds! All our equipment at Holiday River Expeditions is best quality and kept in perfect working condition. You’ll find our rafts and bikes clean and well-maintained. Our oared rafts are 17-foot long and we design and construct the rigging ourselves to make certain that it’s top notch. After 45 years in business, we understand the importance of excellent equipment that you can count on. “Paddling Colorado River” The 15-foot paddle rafts are for those who want to get in on the action and they allow guests to participate in rowing downstream. On the multi-day trips, it’s important that you be in good physical condition because many of the rapids on the Colorado River require intense labor to maneuver through. Our bikes are made by Specialized and they are well known in the mountain biking industry. We have a mechanic on staff who maintains our bikes, ensuring that they are in excellent working order. Inflatable kayaks are also available for those who want to go exploring down some of the gorgeous side canyons on the Colorado River. Our camping gear is the best and after so many years of working as river guides, we know a few things about comfortable bedding. You can bring your own bedding, of course, or rent ours. We provide foam sleeping mats and clean sleeping bags for those who want them. Our tents are rain-proof, clean and well maintained. We make sure our guests arrive safely and in comfort with Ford Passenger vans that are always kept clean and well maintained. The Colorado River rafting journey is offered in 5 or 6 day trips between the months of May and September each year. This exciting trek begins in Green River, Utah. Green River is a scenic town with plenty of panoramic mountain views. Located in the Southeast Corner of Utah, Green River offers its visitors numerous hotels, restaurants, and the John Wesley Powell museum. Holiday River Expeditions also offers Grand Canyon river rafting, Idaho and Utah River Rafting, family rafting trips, and mountain biking tours.